SAULT STE. 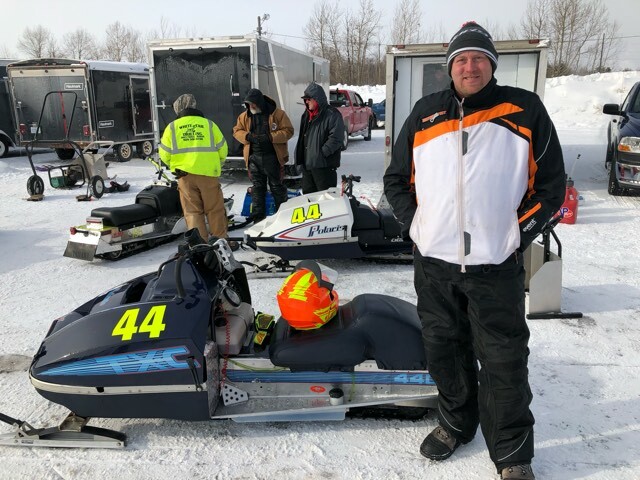 MARIE, MI – Jan. 27, 2019 – Day I of the 51st Annual International 500 Snowmobile Race Week is Complete. Kyle VanSloten was the big winner of the day with Two Feature Wins (440 Free Air Super Stock & 340 Free Air Super Stock) in the Inaugural Soo Super Stock Shootout. Overall, he scored six Checkered Flags on the day as he won the 440 Fan Super Stocks A-Final and Three total Heat Races in Great Lakes Antique Snowmobile Series action on the 1-mile ice oval in Sault Ste. Marie, MI. Tim Gregory (45+ 340Fan/250 Free Air Super Stock Combo) picked up a Feature Win while Ryan Wolfe (F500/440F A-Fan Super Stock) & Joey Burch (F500) inherited Feature victories after Stephen Town and Matt Town, who both crossed the start/finish line first in their respective Features, were disqualified at Post-Race Tech. Earlier in the afternoon, M. Town was the overall Fast Qualifier for the day with a lap measured at a 45.488 = 79.142mph. He also won the F500 Heat Race. S. Town won the lone F500/440F A-Fan Super Stock Heat Race while Gregory picked up the 45+ 340 Fan/250 Free Air Super Stock Combo Heat Race victory. VanSloten started his day with a Heat Race Win in both the 440 Free Air Super Stocks and 340 Free Air Super Stocks. In Brad Redman Memorial Qualifier races, VanSloten earned the pole for the 440 Fan Super Stocks with his win in the A-Final while Brandon Rairigh grabbed the victory in the 340 Fan Super Stocks A-Final. Kierstie Piche-Belleau become the first female in #SooI500 history to win an event when she scored the victory in the Single Stock A-Final. In preliminary events, Chris Piche and VanSloten won the 440 Fan Super Stocks Heat Races while Joey Burch won the Last Chance Race. Gordie Postula and Dustin Fierek grabbed the checkered flags in the 340 Fan Super Stocks Heat Races as Mike Galarowic collected the Last Chance Race win. Finally, in the Single Stocks, Chris Kelly won the lone Heat Race. (F500) NOTE: Flagged Winner, Matt Town was DISQUALIFIED in Post-Race Tech. (F500//440F A-Fan Super Stock) NOTE: Flagged Winner, Stephen Town was DISQUALIFIED in Post-Race Tech.